Think about that. What God do you perceive? The Christian tradition only recognizes one God, but there are countless different perceptions of that God within Christianity. High church traditions emphasize God’s holiness while low church traditions emphasize God’s accessibility. Liberal Christians proclaim the transformative power of God’s grace while conservative Christians proclaim the transformative power of God’s grace. Some people are drawn to God’s love and acceptance while others are repelled by God’s judgment against sin. The Son’s death on the cross is an act of supreme love and sacrifice or a heinous example of child abuse, depending on how you look at it. The God you perceive is the God you receive, and the God you receive is the God you project. Today is the beginning of Lent, and I invite you to use this season to reflect on Jon Scott’s statement. The answer’s not as straightforward as you might think. A lot of people don’t really give this question much thought; God is God. Maybe you learned about God in church or from your family, and you’ve never really questioned those teachings. I invite you to question them. Not in order to cast doubt on your beliefs, but in order to better understand what you believe. Who is this God you worship? Or, if you don’t worship God but are brave enough and open enough to consider the question, who is this God you don’t worship or believe in? What does the bible say about God? How has God acted (or not acted) in human history, and what does that tell you about God’s character? Spend some time in the bible with an eye toward who God is, what God has done, and why. Look at your favorite go-to verses but also look beyond them. Anyone can cherry-pick through the bible and see what they want to see, but I encourage you to look at other verses, as well. And not just the verses, but entire passages, chapters, even books. What is the context of these verses? What was going on? Who was involved, and how? If you’re not all that familiar with the bible, or even if you are, I suggest starting with the Gospels (Matthew, Mark, Luke, and John). Read them in any order you wish. Those four books focus on explaining who Jesus is and why he came, and the entire Christian tradition centers on those questions. You might want to read the Acts of the Apostles immediately after Luke, as the book of Acts is written by the same author as Luke and continues the narrative beyond Jesus’ death and resurrection, showing how his followers responded to those events in the months and years following them. And that should be more than enough to keep you busy during the six weeks of Lent. How do you receive God? Once you have a better idea of what you believe about God, consider how that belief affects you. Does it affect you? Does your understanding of who God is inform the way you live your life? Maybe it only impacts some aspects of your life and not others. Consider whether or not there are areas of your life that you believe God doesn’t apply or belong. There’s an old story that claims a Roman emperor had his legions of soldiers baptized en masse, but they all kept their sword hands out of the water. The common interpretation is that we all keep something back in our lives that we won’t give over to the lordship of Christ. Is there something in your life that you intentionally keep separate from your life of faith? Why? How does that fit in with how you understand your faith and what you believe about God? Consider your feelings about God. Do thoughts of God invoke fear? Love? Admiration? Respect? Loathing? Really think about that and reflect on it. It’s not navel-gazing unless you never move beyond it, but it’s a valuable question to ask as part of an overall process. 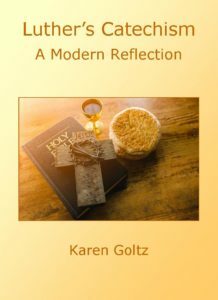 How do you reflect God? Once you’ve articulated to yourself who God is and how you have received God into your life, think about how others might perceive God through your words and actions. Be careful here: there’s a profound difference between what we want people to see in us and what people actually see in us. Try to step outside yourself and look at yourself with someone else’s eyes. Imagine you’re someone who knows nothing about the Christian understanding of God. Look at your social media posts. Think back on conversations you’ve had. Examine your calendar and your credit card statement. How do you spend your time and money, and what values do they reflect? You might notice a disconnect here. Don’t be afraid of it. Describe how someone might see God if they had only your words and actions to go by. Write it down or say it out loud, to yourself or to someone you trust. Be honest. Does that description match the God you worship? If not, take another look at your beliefs about God. Are they really what you say they are?